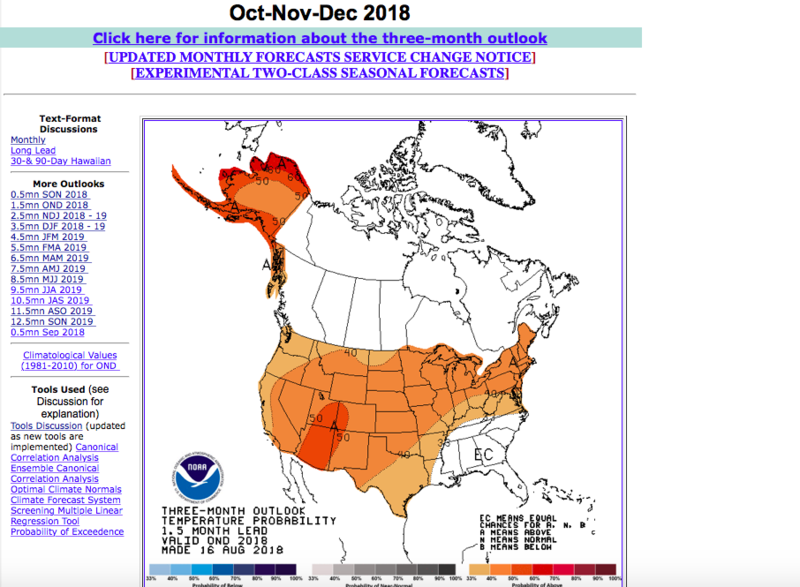 The national climate service has been pounding home lately that temperatures will be above normal for the foreseeable future. They were dead on in their prediction of a hot summer in the Pacific Northwest and there are records to prove it. Portland ended up with not only the most days above 90º (31 as of 9/19/18) it happened in a really interesting way. Rather than many brief heatwaves of which we are famous we experienced extended periods above 90ºF. For days on end. Normally we have brief heatwaves as a front passes and a thermal trough builds over the ocean. High pressure establishes inland and for the first day there is offshore flow. This is what causes rare hot days (single days) at the coast. The air is drawn off shore and it heats and dries as it descends the landmass. This usually plays out in several days until the high pressure moves to the east courtesy of a moving jet stream. Cool ocean air rushes in and the process begins again- throughout summer. This gives us on average 12 days above 90ºF throughout summer with at least one day peaking at or above 100ºF. (We did that this year, peaked, one day at 100ºF) This year we not only had the most days above 90ºF for one month, the most for the month of July (15) and with just brief cooler respites. For all of summer a staunchly permanent area of high pressure from the SW US would slightly retreat and then rebuild. Summer was surprisingly stagnant. This is a term that you should become used to in the future. The jet stream which is propelled west to east occurs because of the high temperature gradient between the poles and the equator. Air masses meet at about 45ºN, our latitude and are propelled along by this river of air. The poles are warming much, much faster than the equator. This quells the temperature gradient and the jet stream becomes de-engergized. It slows down, it backs up on itself and weather system stall. This was more than evident this summer as record temperatures across the globe seemed to freeze in place as the slowed jet stream did wild gyrations. All time record temperatures were set across the northern hemisphere. From Glasgow, Scotland, to both Koreas, Japan, California, Pakistan these are just a few locations that baked with all time high temperatures. The all time warmest overnight low was recorded in Southern Pakistan 108.9º and the continent of Africa hit its all time official high of 124.5ºF in Algeria. At one point models indicated temperatures above 90ºF in northern Siberia in the most extended arctic heatwave ever observed. This is a direct process of a jet stream that is slowing down. And it is naturally slower in summer so the effects are dramatic. In essence weather systems are not moving along as fast as they once did. The weather is more prone to getting stuck. This is active climate change where we are finally seeing what scientists have been predicting. Climate change is driven by global warming but there is an important distinction to make between these two phenomenon. Warming of the poles IS changing our climate. We can expect weather systems to become more permanent that means when its hot it gets hotter by length of regime or when it rains the rainfall tends to stall over the same place and a warmer atmosphere can hold much more water. A good example of this was last years Hurricane Harvey in Texas and Hurricane Florence in the Carolinas this year. Normally an active jet stream would entrain these storms as they moved north whisking them away. Instead, a lagging jet stream left these storms to linger and dump insane amounts of rain over a relatively small area. Expect more of this in future. Possibly the most stunning example of longer heatwaves has been the dramatic increase in extended days above 90ºF that Portland has experienced in just the last half dozen years. Four of those years have seen more than 20 days per year above 90ºF with the past record of 29 just three years ago in 2015. The question is if this is a trend? Is the Pacific Northwest slated for more hot summers? Surprisingly, most of North America has not seen an appreciable increase in summer time heat. So, is the west where the heat begins? Ice ages which cycle in every 20,000 year or so are interrupted by what are called interstadials. Warm periods between the cold dips. 6000 years ago we peaked in what was the warmest phase of an interstadial in many cycles. An example of this is the way the vegetation changes with the climate. For instance during the warmest period when we are 1.3ºC warmer than present Portland has quite a different natural taxa assemblage. South moves north and our climate is much more in line with present day Medford’s climate- 350 miles to the south. There they experience 30+ days on average above 90ºF and a drier climate with a longer season of drought. It supports a forest composed less of mesic plants and more xeric taxa. During the last interstadial Portland was a sea of drought tolerant oaks and ponderosa pine with thickets of Arctostaphylos columbiana and Ceanothus cuneatus. Conversely, during the ice age the climate is vastly different. Glaciers which stall just north of the Willamette Vally in southern Puget Sound cause the weather to be MUCH colder and drier. The Portland area has a climate very similar to just east of Government Camp over the Cascade crest. Snow, wind, clouds, and very dry. Cold tolerant Lodgepole pine and Aspen dominate. This is just with 1.3ºC of temperature change over a 6000 year period. We’ve already seen that amount of warming in the past 50 years. So, we are in for quite a climate ride. Climate change is here to stay. We’ve already set in motion a process that will take thousands of years to settle out EVEN IF we STOPPED ALL CO2 input immediately. So the scene is pretty much cast. There are several things that could arrest warming temporarily, though they are not good options. A enormous volcanic eruption could put enough material in the atmosphere to cause temporary cooling. The last massive eruption that affected the planet on a global scale was Mt. Pinatubo in the Philippines in 1991. That effectively cooled the planet for 1ºC for up to two years. But thats a long shot and not a good option. Just thought I’d mention it. 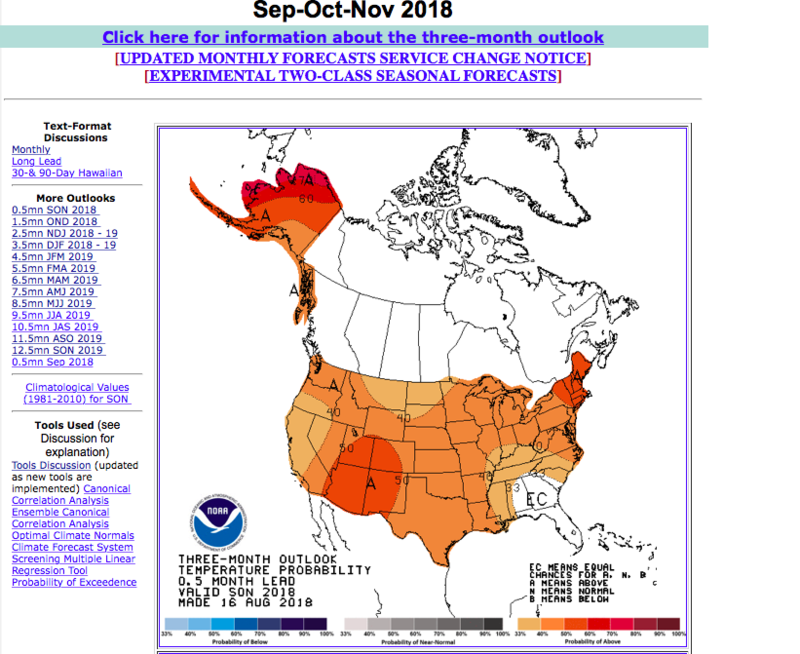 Here are the maps for the coming months from the National Climate Service. The theme, is continuing to be warm, warm, warm. And as this summer was predicted to be hot for a long period ahead of time. These forecasts are not only remarkably consistent they are consistent for a long time for large parts of the continent. These are just temperature forecasts. The precipitation forecasts are less dramatic, periods of normal precipitation interspersed with drier periods. We’ll have to wait and see if an extended drought is in our future. This is typical where a weak El Nino is forecast. This years’s El Nino which is common to follow a La Nina directly, doesn’t look like its going to be a great weather game changer. As with current trends expect a warmer than normal winter- most likely zone 9 for Portland. This corroborates a 50 year trend where 4 out of 5 winters are above 20ºF in the city. So, good news is that plants will likely not suffer terribly from cold this winter. Thats not 100% set in stone but its a trend that shows real teeth. If anything winter gets even more mild in December and January. Interesting.. . So it would appear that a weak El Nino- which typically brings milder, drier, and over all bland weather to the PNW is set to take hold. Statistics would favor a milder than normal winter. There have been arctic intrusions during El Nino years but they are rare and few. 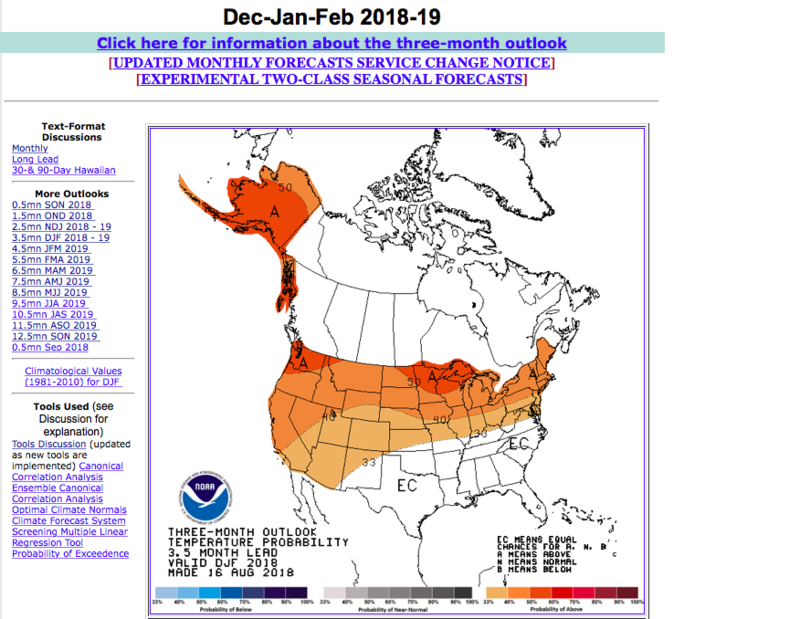 Based on this climate forecast and past analog years it looks like mild and boring are the two words for winter 2018/19. please include various solutions and strategies. So much depends on what policies we enact, or don’t enact. All three methods will make a difference within a few decades, and will eventually save vertabrites’ on earth. If we do nothing, our planet eventually turns as hot as Venus! For example, a carbon fee and dividend such as Citizens Climate lobby proposes will save about 1,600 heat wave caused premature deaths in the great lakes area by 2040, say climate scientists at the University of Michigan. i only wish I had more space and people had longer attention spans to include these solutions. Unfortunately, my job doesn’t allow me time to get more deeply involved. But i think its critical that people understand what climate change is and what it means. People are surprisingly ignorant.